If you’re dipping into a bag of pistachios as you read this, take a pause and check to make sure your nuts aren’t among those recalled after 11 people in nine states became ill from salmonella-tainted nuts. Wonderful Pistachios — which also makes nuts under the Trader Joe’s and Paramount Farms brands — announced a recall of a variety of flavors and sizes of in-shell pistachios after the Centers for Disease Control and Prevention linked a multi-state Salmonella Montevideo outbreak to the nuts grown in Lost Hill, CA. 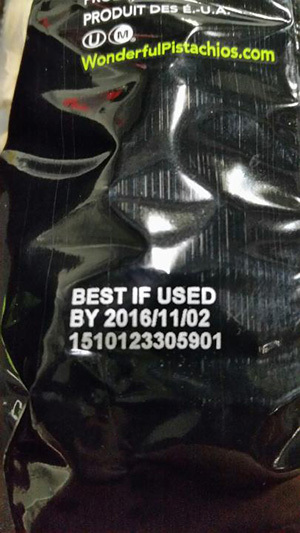 Affected packages of Wonderful Pistachios can be identified by the lot number on the back. According to the CDC, two people each in Washington and Arizona, as well as one person each in North Dakota, Minnesota, Michigan, Alabama, Georgia, Virginia, and Connecticut reported becoming ill between Dec. 12, 2015 and Feb. 9, 2016. Eight of the nine people interviewed by the CDC say they ate pistachios in the week before becoming ill, and five of those eight people reported eating Wonderful brand pistachios. “Recent laboratory testing isolated the outbreak strain of Salmonella Montevideo from samples of raw pistachios collected from Paramount Farms, where Wonderful pistachios are grown,” the CDC said in a statement. As a result of the CDC’s findings, Wonderful Pistachios voluntarily recalled several types of its nuts on Wednesday. According to a notice from the Food and Drug Administration, the nuts, which were distributed through several retailers nationwide and Canada, can be identified by a 13-digit lot code number [PDF] that can be found on the lower back or bottom panel of the package. Consumers who have purchased Wonderful Pistachios tied the to recall can return the product to the company via mail or to the store where they were purchased for a refund.